When to use: If market is within or near (A-B) range and has been stagnant. If market explodes either way, you make money; if market continues to stagnate, you lose less than with a long straddle. Also useful if implied volatility is expected to increase. Profit characteristics: Profit open-ended in either direction. Break-even levels are at A – cost of spread and B + cost of spread. However, spread is usually not held to expiration. Loss characteristics: Loss limited. Loss is equal to net cost of position. Maximum loss occurs if, at expiration, market is between A and B. 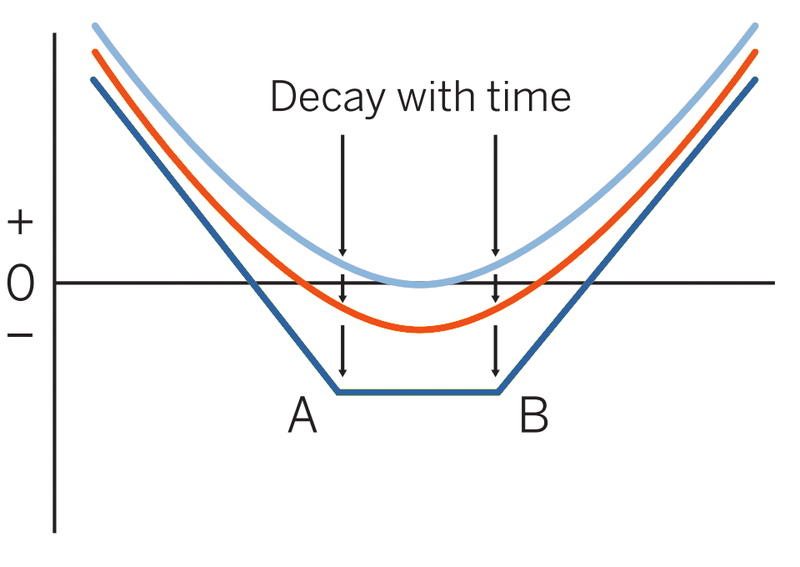 Decay characteristics: Decay accelerates as options approach expiration but not as rapidly as with long straddle. To avoid largest part of decay, the position is normally liquidated prior to expiration. This trader looks at the low implied volatility and feels that options are relatively cheap. The thinking here is that this market will have a very big move. However, the trader is not sure which way it will be, so he decides to buy both a call and a put. The trader saves on premiums by buying both options out-of the-money. However, the trader must get an even larger move than a long straddle to make this strategy profitable by expiration. Breakeven: Downside: 0.5002 (1.0000 strike – 0.0098 debit). Upside: 1.0298 (1.0200 strike + 0.0098 debit). 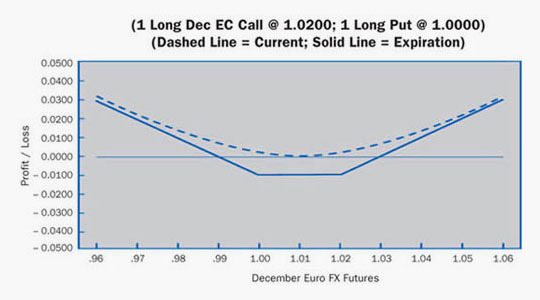 Loss Risk: Losses bottom at 0.0098 with a maximum loss between 1.0200 and 1.0000 strikes. Potential Gain: Unlimited; gains begin below .9902 and increase as futures fall. Also, gains increase as futures rise past 1.0298. This is primarily a volatility play. A trader enters into this position with no clear idea of market direction but a forecast of greater movement in the underlying futures.